Today's bento celebrates the fact that summer has FINALLY arrived in the bay area. We have had seriously chilly weather for most of August, so much so that one of my pals nicknamed it the month of Fogust. Ha! Today we are hitting the upper 90s and 100s. Woot! I will not complain, at least not for a few days, because I have sorely missed this hot hot heat. Summer (and I mean the real summer, not wishy washy milquetoast summer) means no or little cooking and lots of fresh tomatoes. Caprese salad is my go-to dish when it gets this hot. I took the caprese salad idea and applied it to bento by making these caprese skewers. In this bento: steamed corn on the cob from Duffy at the Santa Rosa Farmers Market, edamame, an Italian Sugarplum from Triple T, two baby carrots, two turkey patties, grapes from Neufeld Farms, and caprese skewers made with cherry tomatoes from The French Garden in Sebastopol, basil from the Wednesday Night Market, and fresh mozzarella cheese. If you missed the interview I did with Sheri of Happy Little Bento yesterday, I have uploaded it in two segments here. It was really fun and I think we were able to demystify bentos for those who are curious about how to make them. Excellent interview, congrats SB and Sheri!! It was entertaining, informative and sure to inspire listeners--yay!! Listened to the interview. Excellent!! Congratulations to you and Sheri. Thanks for the sharing. Love the Caprese skewers idea. Thanks bentobird! It looks like the summer won't last long. They say the cooler temps are back again this weekend. Harrrumpf. Hi Lyndsey! The skewers didn't need any oil or additional seasoning, although a sprinkle of salt probably wouldn't hurt. Easy peasy. Thanks for listening, Emily! It was so fun to talk to Sheri. I feel like I know all of you bento friends a little, so it was really cool to actually talk to one over the phone! Headed to the store now for moz. I have been hearing from my friends that it is HOT HOT HOT in the bay area! Definitely nothing HOT to eat. Cold and refreshing is the way to go! Your bento is definitely refreshing!! I was just tweeting the mini caprese skewers with Hapa Bento this morning. 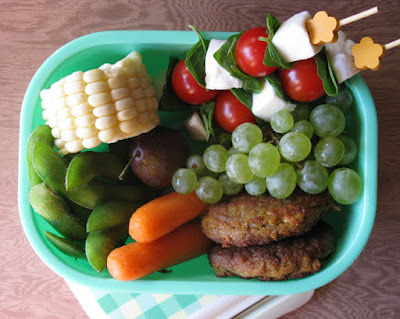 I'm a big fan of the no-cook bento too, especially in this last blast of summer! Thanks for the upload and inviting me to help spread the bento love! btw, i'm just hearing the radio interview with sheri. what a great interview! Good to hear voices of the two of you. Now whenever I read you and sheri's blog, I will be hearing your voices. haha! Hi slushygirl! yum yum caprese! Thanks sheri! I will send you CD copies of the interview today. Thanks ohayobento! It was fun to talk about my bento obsession with someone who understands it. :) Kind of like therapy. Hee hee. Hi Journal Mommy Yenny! I am squeezing every moment out of this hot weather. :) Your package was mailed off today! Thanks Lia! I don't think you could stop me from making bentos. :) I'm hooked. Thanks so much tatabonita! And they were really easy to make, too! Happy summer! This bento is certainly refreshing for a hot summer! Love it! Hi dragonmamma! I'm with you! I think I had a bit of heat exhaustion. I was supposed to set up at the Wednesday Night Market for our station, but I figured collapsing in the heat would not have been a good idea. Thanks Kids Dream Work! It would be a fun thing for kids to help make, too!